What’s a mere $150,000 fine to a boss like UFC featherweight champion Conor McGregor (pictured)? One less drop-top Rolls Royce Phantom for his expending fleet, I assume. That’s likely why the Nevada Athletic commission also tacked on 50 hours of community service for McGregor’s part in August 17’s UFC 202 pre-fight press conference melee where he and Nate Diaz flung bottled water and canned drinks at each other from across the venue. Francisco Aguilar chimed in and said the “cost” of McGregor’s time essentially equals dollars, so they unanimously settled on 5 percent and 50 hours of community service. Worse case scenario for McGregor, who phoned in to Monday’s meeting while his attorney represented him at the proceedings, would have been a suspension, which would have cost him his sport in next month’s UFC 205 title tilt against lightweight champion Eddie Alvarez. McGregor apologized for his actions and said the pressure of avenging March’s shocking upset loss to Diaz fueled his rage. “I acted wrong and all I can say is I’m sorry.” McGregor said, while admitting he acted erratically because the rematch with Diaz was the biggest fight of his career. Diaz was also slated to appear at today’s hearing, but his meeting with the NAC was postponed until later this year. If he’s hit with the same financial punishment that McGregor received, Diaz will lose $100,000 of his $2 million purse. The money is just a drop in the bucket for McGregor, who last month boasted that he intends to close 2016 with $40 million in the bank. Per usual, McGregor arrived roughly 20 minutes tardy to the UFC 202 pre-fight presser. Diaz appeared agitated immediately after seeing McGregor hit the podium fashionably late. Diaz sat through a few McGregor questions, roughly eight minutes worth, before he had enough and bolted from the table with his entourage, flipping his nemesis the bird the whole way out. “F**k your whole team, how about that?” Diaz shouted at McGregor. “Shut your f**king mouth, you’ll do nothing. Not one of ya will do nothing. Get the f**ck out of here!” McGregor screamed back at Diaz and his crew, which included big brother, Nick Diaz. Nate Diaz then threw a plastic water bottle in McGregor’s direction, and that’s when all hell broke loose. McGregor returned fire with any bottle and can he could get a hold of. Several people in Diaz’s entourage, including former UFC and Strikeforce star Jake Shields, heaved more bottles at McGregor. 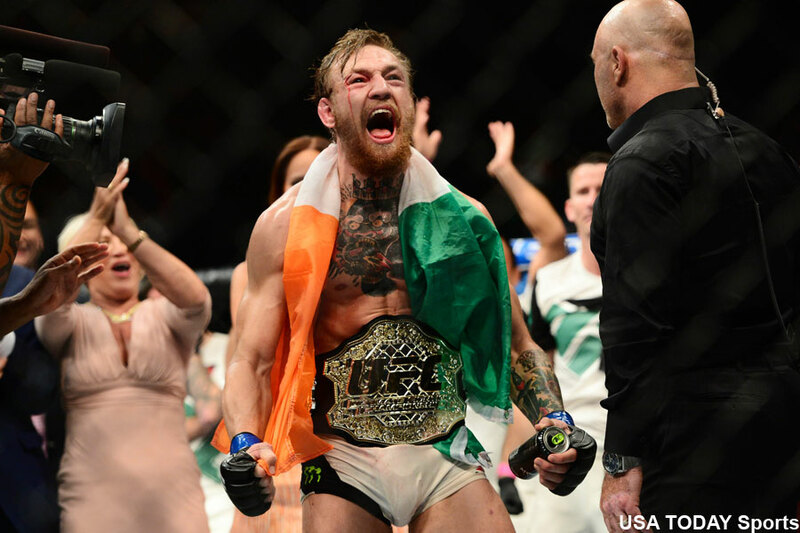 McGregor went on to post a controversial majority decision win over Diaz in a thrilling back-and-forth battle three days later.